The epic war drama and Jackie Chan's 100th film is coming to Blu-ray early next year. In an early announcement to retailers, Well Go USA is prepping '1911' Blu-ray/DVD combo pack as well as a Collector's Edition Blu-ray for a release on January 10. From the walls of the Forbidden City to the battlefields of China, with no expense spared in production and no detail ignored in its quest for historical accuracy, making '1911' a true epic in every sense of the word. The film details a key moment in modern Chinese history—the fall of the Qing Dynasty—and the violent rebellion that brought it down. In addition to Chan (who also co-directed with cinematographer Zhang Li), the film also stars Li Bing Bing ('Triple Tap'), Winston Chao ('The Wedding Banquet,' 'Eat Drink Man Woman'), Joan Chen ('The Last Emperor,' 'Lust,' 'Caution') and Jaycee Chan ('Break-Up Club'). The extensive bonus features include deleted scenes, interviews with Jackie Chan and Li Bing Bing, a making-of featurette and behind-the-scenes footage. Suggested list price for the Blu-ray/DVD combo pack is $29.98 and the Collector's Edition Blu-ray is $32.98. 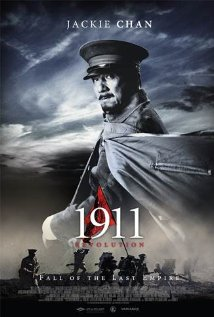 You can find the latest specs for '1911' linked from our Blu-ray Release Schedule, where it is indexed under January 10.